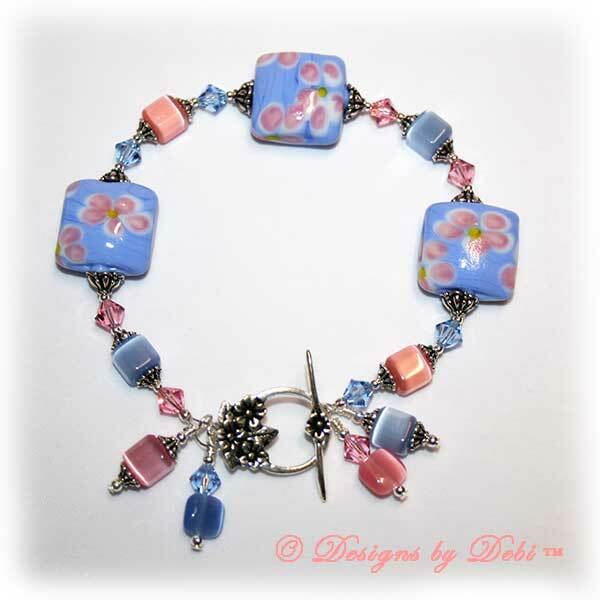 I began this bracelet with square pillow artisan lampwork beads handmade by Debbie Knowlton of Beadiful Lampwork Beads. They have a beautiful blue base and pink flowers. 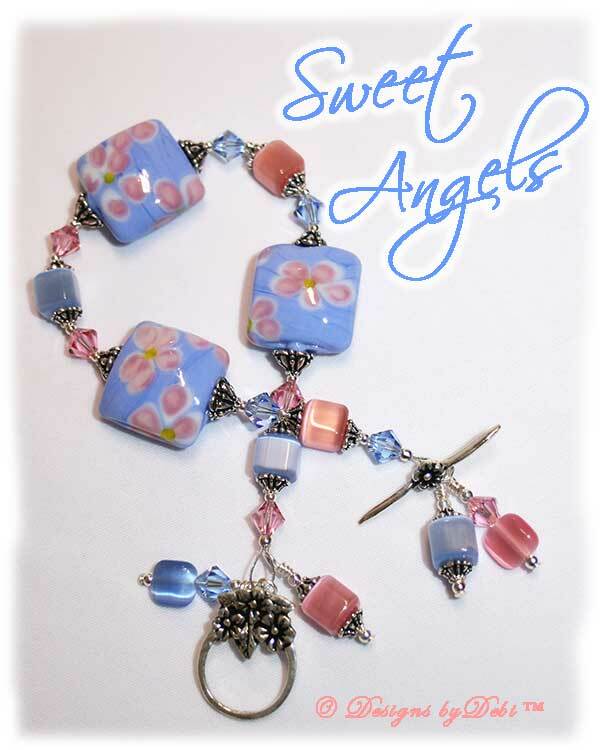 I accented her beads with light blue and light pink cat's eye cubes and Swarovski® crystal bicones in light sapphire and light rose. The glass and cat's eye beads are capped with two sizes of wonderfully detailed Tiffany bead caps by TierraCast®. The bracelet finishes with a sterling silver floral toggle clasp that coordinates perfectly with the beads. 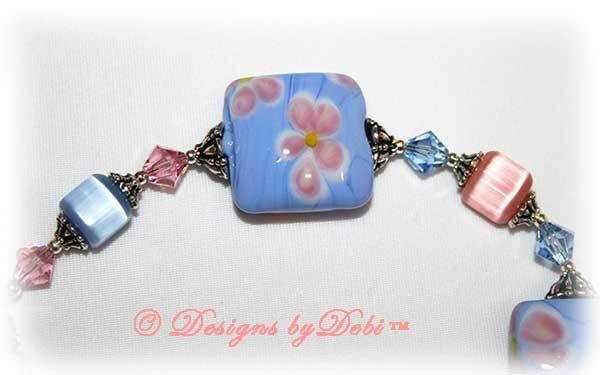 I hung dangles on both ends of the bracelet near the clasp. They were made with Swarovski® crystal bicones, cat's eye cubes, cat's eye square puffy pillows, Tiffany caps and sterling silver round beads in opposite combinations of blue and pink. October is National Pregnancy and Infant Loss Awareness Month and the Awareness Ribbon for this cause is light pink and light blue. That's the reason for the pink and blue color scheme of the bracelet. And if this is a cause that's meaningful to you, I can add the Awareness Ribbon charm (shown in one of the photos) to the bracelet at no charge. The charity I've chosen to receive the donation from this month's piece is Missing GRACE Foundation. Missing GRACE Foundation is an international support organization formed to help families on their journey through pregnancy and infant loss, infertility and adoption. It was founded by Candy and Stephen McVicar in response to the stillbirth of their firstborn daughter Grace due to an umbilical cord issue. It was determined that Grace was healthy and her life could have been saved with proper medical intervention. There are approximately 109 stillbirths in the United States every day totalling over 40,000 every year. If you combine the statistics of miscarriages, stillbirths and other infant deaths it amounts to over 1 million families affected by these tragedies each year. Missing GRACE Foundation partners with the Pregnancy Institute and the National Center for Stillbirth Research to support research and offer programs to decrease infant mortality statistics and give families hope. They also provide resources and support for families that have experienced: pregnancy loss, infant loss, infertility or adoption and advocate for comprehensive, patient-focused prenatal care for all women. If you visit their website you will find a wealth of information, medical news, educational materials, memorial and support products and services as well as links to their various online support groups. To find out more about Missing GRACE Foundation or to make a donation on your own, go to www.MissingGrace.org. The bracelet measures 9 1/2 inches and will fit a 7 1/4 inch (very loosely, but secure) to 8 inch wrist. If you need the bracelet re-sized, please let me know at time of purchase and this can be done prior to shipment at no additional charge. Note: If you are looking for a traditional style sterling silver and crystal Awareness Bracelet, you can find them on the Awareness Bracelets page. They are available in all colors. 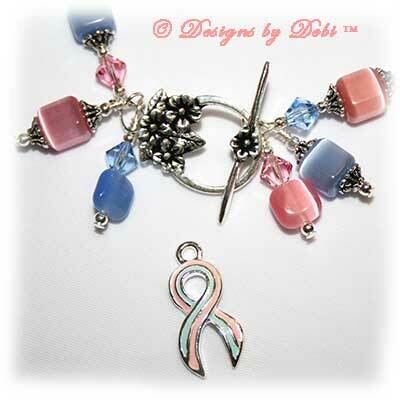 For more information on the Designs by Debi™ Jewelry for Charity Program, check out the Jewelry for Charity page.